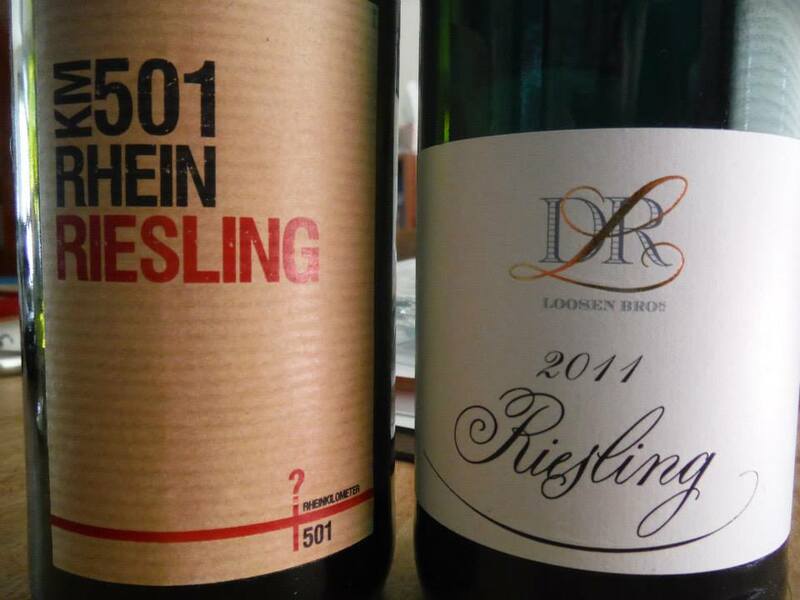 Today I want to compare two entry level Rieslings from Germany: the 2011 Loosen Bros. Dr. L Riesling and the KM501 Rhein Riesling. I know, summer is over and I should have posted this way earlier, but somehow I only got around to tasting these two wines side by side now. I’ve had the bottle of KM501 in my cellar for a bit now, and I always have a stash of Dr. Ls. I wrote about the 2010 vintage of Dr. L here. The wines come from the two regions in Germany that have the most clout when it comes to Riesling: the Mosel valley and the Rheingau. While most of you are probably by now bored with my singing the praises of the Mosel, let me introduce the Rheingau, albeit briefly. The Rhine, which this area borders, flows pretty much straight forward North-North-West once it leaves Lake Constance at the German-Swiss border. Except for a stretch of roughly 30 kilometers beginning in my hometown Mainz. There, the Rhine takes like a 100 degree turn to the West and then flows straight West-South-West until Bingen where it does another 100 degree turn and goes North-North-West again. We call it the knee of the Rhine. If you look at the map, you know why. This creates quite perfect growing conditions for the Rheingau, which sits atop the Rhine with vineyards facing straight South. In cold climate wine regions, like Germany, it is especially important for grapes to catch all the warmth they can, so south-facing vineyards are great because they get sun all day. Add in the reflection of the sun from the river that hits straight into the vineyards and warms them up and the moderate climate a river provides and things are actually pretty great…at the Mosel, it is also very common for good vineyard sites to be facing South. While the Dr. L is made by Ernst Loosen, the KM501 is made by Balthasar Ress, a winery with a long history in the Rheingau (the family’s owned the winery since 1870). Both wines are entry level wines and made with grapes from the area, albeit not necessarily grown by the wineries. KM501 refers to Rhine Kilometer 501 (when traveling along the Rhine you will notice signs that mark every single kilometer of the river as well as the half kilometers in between). 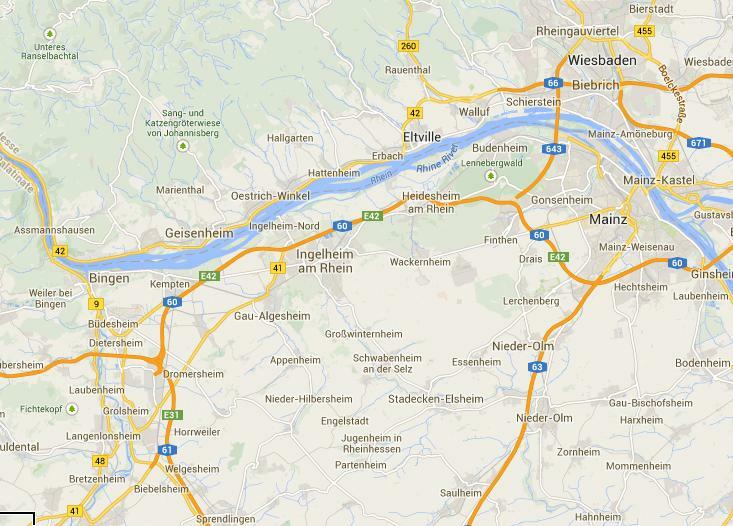 The winery picked the name because the Rheingau starts at Rhine Kilometer 501. Both wines are made from Riesling grapes and both are from 2011, a year that saw rather good growing conditions with overall modest acidity in the grapes and therefore resulting wines. Most importantly, both wines don’t break your bank and are available for around $9 to $12 (I paid $9 for each). 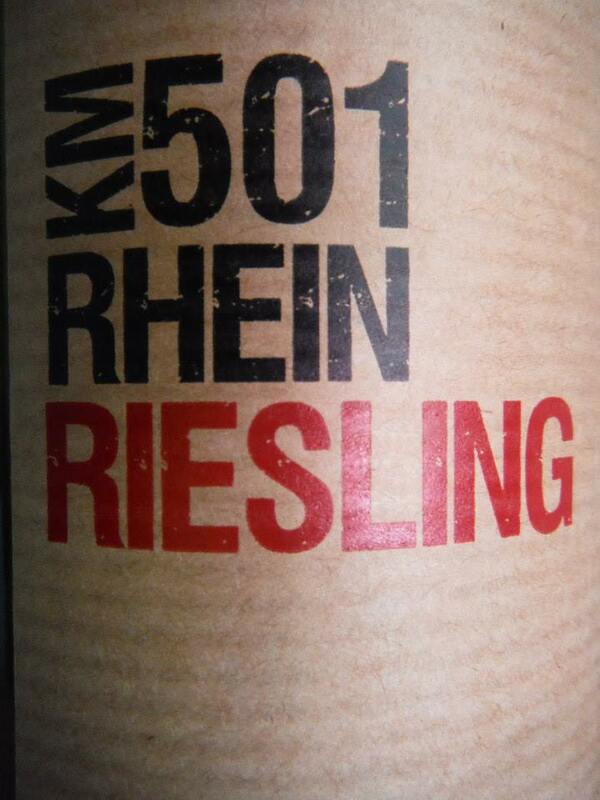 We started with the KM501 Rhein Riesling. 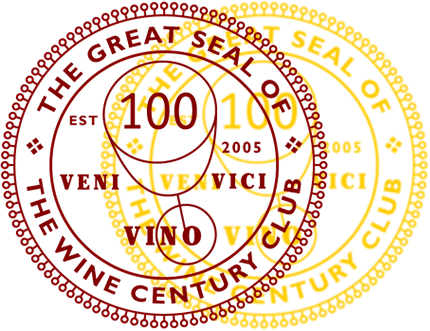 You can find more information about the wine on its American importer website here (although it seems weirdly devoid of real information). According to the label, the wine has 9.5% ABV. In the glass, a light yellow wine presented itself, with hints of green. In the nose, I got grapes and citrus, lots of citrus. Nice. On the palate, the light bodied wine tasted like white grapes, was soft, with some peach and pear and residual sugar. Acidity was mild and the wine showed a decent length finish. There were some bitter aromas at the end. All in all, a pretty solid wine in my book. Typical summer afternoon quaffer that one can down a bottle or two without a problem. I was pleasantly surprised by the quality of this wine. We then opened the Loosen Bros. Dr. L. More information can be found here. The label noted 8.5% ABV. The wine presented itself in a slightly more intense yellow than the KM501. The nose was very fresh (I am using this descriptor again, not sure how else to describe it), with peaches and sweet pear coming in. Lovely. On the palate, the Dr. L showed more residual sugar than the KM501, with peach and apricot coming in. The mouthfeel was soft and silky, but I wished there was a bit more acidity in this. It was just a tad too sweet but still refreshing. The finish was good. I did not get any bitter notes as I did in the KM501. There was also a certain creaminess in the wine, which I enjoyed. But, bottom line: No more excuses not to try affordable, enjoyable Riesling from Germany! KM501 was available at World Market last I checked, and Dr. L is available at Trader Joe’s or Costco. 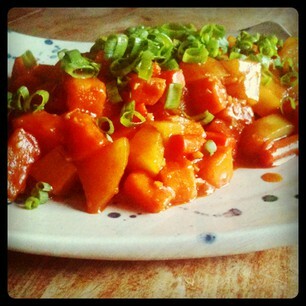 Oh, and we had them both with the Korean spicy potatoes that we love, and they both nicely held their own. So, once again: Pair Riesling with Korean food!!! I love Dr. L. It’s one of my standby recommendations for riesling with just a kiss of sugar. Like lemonade. Great post! Oliver, Balthasar Ress was my 6th great uncle. The winery is still run by my distant cousins. For that reason, I am partial to Rheingau Riesling in general and Ress (my maiden name) Riesling in particular. I have not tried the KM 501. I usually drink the kabinett. But I will look for it. Cheers! Great side-by-side review, Oliver, with great, super clear tasting notes. They both sound very interesting wines for their price point. They are definitely mass-produced wines, so nothing particularly oustanding, but I do believe they are decent enough everyday quaffers. Hey, thanks so much!! I hope you’ll give them a try! I haven’t tried them–haven’t located a wine shop here that sells German Rieslings (other than those awful blue nunnish styles). I’ve recently met a German woman who lives here. She intimated that “it’s hard to be a German in this state…” I think I’m beginning to understand what she meant. As you may recall I have enjoyed Dr L in the past but do not know KM501. I got to try Blufeld last night at a tasting but was not impressed. A metallic finish was not appealing. 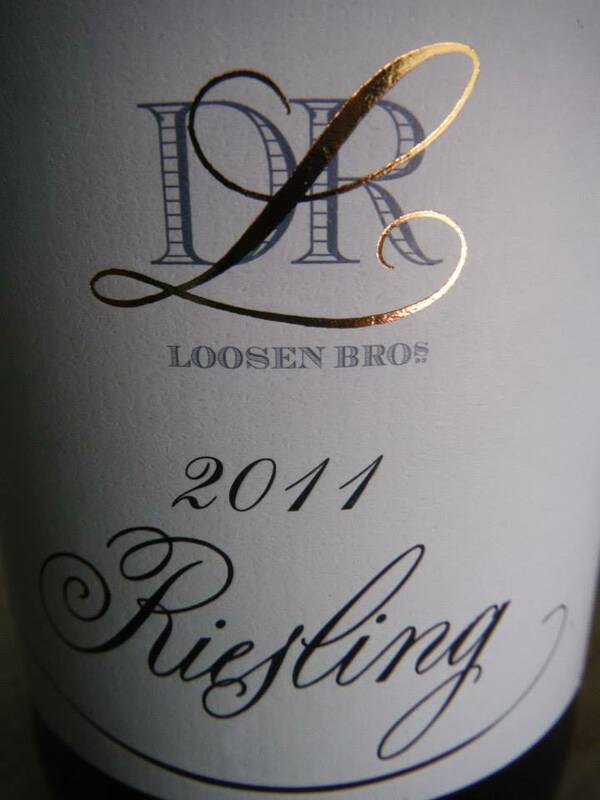 We have a sparkling Dr L Riesling I am looking forward to try. Hope to get you a list of the German wines we carry soon. Glad to hear it was not just me. Thank you. Every time you write that you can buy wine at World Market, Trader Joe’s, or Costco I die a little bit inside…. Great write-up. Next time in Germany I will need to visit the Rhiengau!